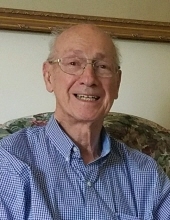 Age 86, of Baldwin (formerly of Beltzhoover), passed away peacefully at home surrounded by his loving family on Friday, February 1, 2019. Beloved husband of 65 years to Dolores Alexandra (Byra) Ober. Cherished father of William (Anne) Ober, Cynthia (Randy) Shope, Michelle (Mike) Knauff, and Melissa (Frank) Fera. Adored Pap Pap of Adam, Stephanie, Jared, WIlliam, Kristin, Brent, Kyle, Jacqueline, Steven, Matthew, and Jesse; Great Pap Pap of Norah. Loving brother of Frederick (Rosemary) Ober; as well as many nieces, nephews, extended family and friends. Wiliam was preceded in death by his parents, Frank and Rose (Masdea) Ober. William is a veteran who served proudly in the United States Air Force during the Korean War, was a Supervisor of train operations for the Pennsylvania Railroad (PRR), Penn Central and Conrail railroad companies. After retiring from the railroad, William worked 5 years with US Steel. He worked part-time for 3 years at Bull Dog Office Products and was known as "Wild Bill" and "Mr. Bill". Above all, William was a family man who loved golf, gardening, his pet dog, and cherished his family. He will be forever treasured in our hearts. Family and friends are welcomed on Monday, February 4, 2019 from 10am to 12 pm at the Jefferson Memorial Funeral Home, Inc., 301 Curry Hollow Rd, Pittsburgh. A Blessing Service will follow at 12 pm in the funeral home's chapel. In lieu of flowers, memorial contributions may be made in Williams honor to The American Diabetes Association at www.diabetes.org/. Online condolences may be left at www.jeffersonmemorial.biz. To send flowers or a remembrance gift to the family of William Frank Ober, please visit our Tribute Store. "Email Address" would like to share the life celebration of William Frank Ober. Click on the "link" to go to share a favorite memory or leave a condolence message for the family.